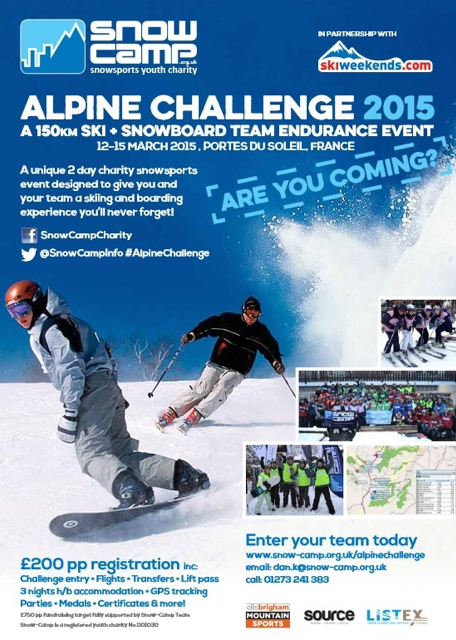 The Snow-Camp Alpine Challenge is back for 2015! Snow-Camp are an amazing charity who use a unique combination of skiing, snowboarding and life-skills programmes to support inner-city young people. Through this combination of snowsports and life-skills, their programmes enable young people to grow in confidence and self esteem, develop as individuals and make positive choices for their lives. Snow-Camp programmes also enable young people to reflect on the key issues impacting their day to day lives, and help them develop new skills to support their futures – particularly towards careers in the snowsport industry. Snow-Camp hold lots of events across the year to help raise funds for the charity to enable them to keep offering the youth passing through the opportunities to help them in the future. Last year at our Hotel L’aubergade, we became the official start and end point for their famous Alpine Challenge! The Alpine Challenge is a 2 day endurance event open to both skiers and snowboarders and is in it’s 6th year! The challenge is a team event where teams of 4 cover 150km navigating to 15 check points across 15 resorts of the Portes du Soleil. It really is a huge challenge and here at Mountain Mavericks and Hotel laubergade we are really proud to have helped raise thousands last winter! It’s easy to register for the Alpine Challenge 2015 and if you need some help figuring out whether you want to be a part of this amazing event then have a read of the interviews we did with some of the amazing kids to come out of the Snow-Camp programme when they came to Morzine this summer! To stay right on the official start and finish point for the challenge just get in touch with us at Hotel L’aubergade! Previous: Can we get excited about the snow yet? Next: Morzine Mavericks host Sweaty Betty Winter photo shoot!